Time to be honest here - I haven't been reading much recently. I was doing so well on my Goodreads challenge too. But I got into knitting and you can't read and knit at the same time, so there went my monthly average. However, you CAN binge-watch "Parenthood" while knitting though, so that's what I've been doing (Sidebar: "Parenthood" is pretty good. If you're looking to binge-watch something, I recommend it). I've also been training somewhat regularly for Muncie 70.3, but more on that in another post. However, I have been diligent and making sure I have finished anything I need to read for book group. 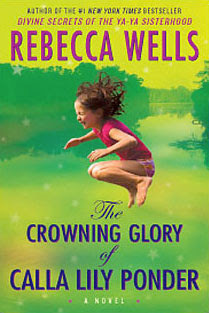 This month, we read "The Crowning Glory of Calla Lily Ponder: A Novel by Rebecca Wells. "The Crowning Glory of Calla Lily Ponder" is the story of a little girl, Calla Lily (obviously), growing up the very small town (less than 2,000 people) of La Luna, Louisiana. Calla Lily has an idyllic childhood, with doting and loving parents, especially her mother who Calla calls M'Dear. Her family is an integral part of the La Luna community with M'Dear operating the local beauty salon (from the family front porch), and both parents running the local dance studio. Calla also has two solid best friends and an interesting new friend named Tuck who moved to town under curious circumstances. Her life is pretty much perfect until (spoiler alert) her mother gets sick from cancer when Calla is in her early teens. It is about this time that Calla becomes much closer to Tuck, and one of the key moments in the book is when Calla and Tuck decide what to do after high school: do they go to college? Or does Calla become a beautician like her mother? The story follows Calla until her early thirties, from La Luna to New Orleans and back, and contains all of the love, heartbreak and humor that I would expect from Rebecca Wells. While it's fluffy and a little predictable in parts, it's a very enjoyable book with quirky, relatable characters (especially if you've lived in the South). And yes, it's sappy. There are lines such as "My big brothers and I learned this at an early age: that it is kindness that makes you rich." But it's sappy in a way that will make you feel good about humanity and believe the in the power of family, friendship, community...and of a good beautician. 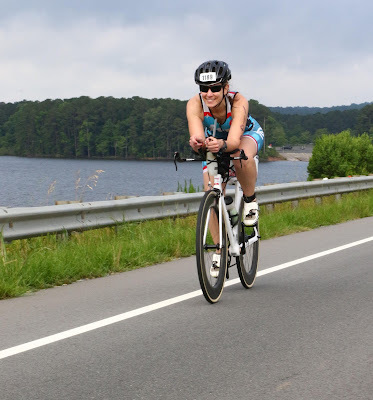 Ironman Raleigh 70.3 Race Recap - Part 2 Race Day! As usual, I had a horrible night's sleep and woke up at 2:30am on race day. My alarm was set for 3:30am - no way was I going to be able to fall back asleep. Not on race day with 1,000 thoughts going through my head. "Did I pack my race belt? Do I have enough GUs? I hope it's not going to be too hot. Crap, was that thunder? I think that was thunder. I hope it's not going to rain..."
Don't have a race belt? A Garmin HR monitor strap works just fine. Around 3:00am, I got up and got dressed and just kind of futzed around until 4:00am when I was meeting Mark (see previous post) in the lobby. Of course, I accidentally woke up Dudley. Bless him. He's such a saint. Not only did he get up with me, but he helped carry my transition bags down to the drop off area. I'm way too perky for 4:00. And how much crap can I carry? I think Mark is still asleep. 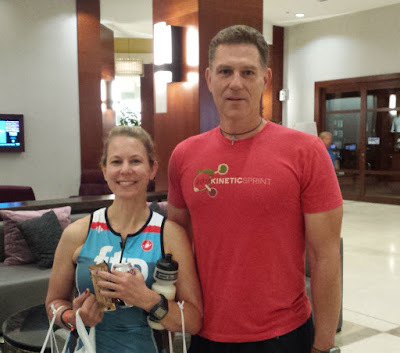 After we dropped off our T2 bags at transition, Mark and I boarded the shuttles to the swim start. Being the Type-A triathletes, we wanted to get out to T1 early to make sure everything was set, but it was also a 45-minute shuttle ride, which is why we got up so early. I have to give props to the Raleigh organizers here. They set us up with comfy charter busses for the ride, rather than shuttle vans or school busses. Things like that are appreciated. Once at T1, I topped off the air in my tires and gave The Weapon one last check. It was still dark out so I couldn't see very well, but I definitely heard something rubbing on one of my wheels. I thought it was coming from the back, but the sound wasn't consistent so I couldn't really tell. I had the bike techs check it out, but all they did was open the brakes. Unfortunately, I had already tried that so I knew that wasn't the issue. After about a half-hour of trying to figure out what the issue was, the sound went away. 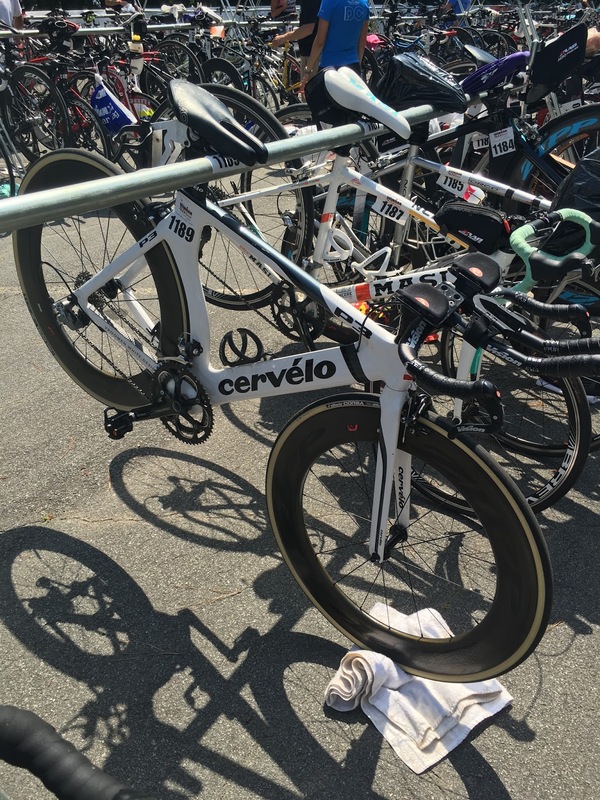 Thankful, I racked my bike and left transition to rest before the start. Dudley and Laura (Mark's wife) took a later shuttle down, and we were all able to hang out a bit before the start. 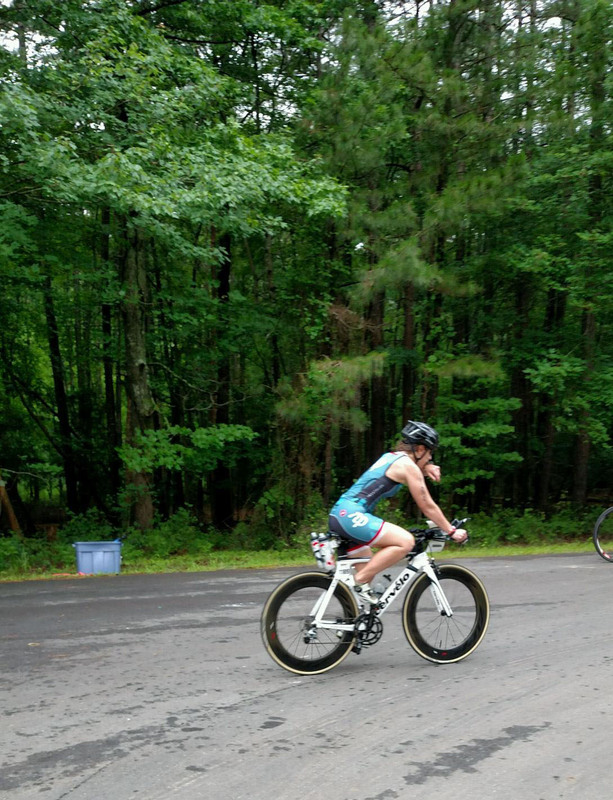 The good news about this particular race is that since I wasn't 100% fit, and am racing another 70.3 in July, Coach Andrew wanted me to use this race as a long training day, rather than a "race." I was never supposed to REALLY push myself, with the hope that I wouldn't shatter myself and still be able to have a decent race in Muncie. While that remains to be seen, the mindset of going into a race as a training day really takes off the pressure. Unlike Chattanooga, where I wasn't fit but still tried to race, I was a lot more calm at the start of Raleigh. The race started at 7:00, and my wave started at 7:45. Time goes amazing quickly when you're waiting for your wave to start. It seemed like one minute I was listening to the National Anthem, and the next thing I heard was my starting cannon. Raleigh had their waves staggered by 3-minute increments (I think...I can't find the info now). This short period of time, along with the design of the race course (a triangle) made it very easy for the waves to intermix, which we did quickly. This was the first race where I kind of felt like I was swimming in a scrum that mass-starts often produce. Previously with my mass-start starts, I was swimming downriver so we could spread out some, or it was small race and there just that weren't that many people around me. In Raleigh though? We were all going for the same line around the first turn buoy and there were arms, legs and bodies everywhere. I was hit, pushed and swum over. Fortunately, I did an OWS the weekend before Raleigh where my friends and I just beat the hell out of each other practicing mass starts, so I was OK with getting beat up a bit. Though I did give one swift kick to someone who was annoying the heck out of me, I was pretty calm throughout the entire swim. I have a mantra of "Reach, Rotate and Relax." I just repeated that over and over again while counting off the buoys. While closing on the first turn buoy, the water started getting a little choppy. It wasn't an ocean swim, but it was a noticeable change from closer to shore. Unfortunately, once we made the right turn, we had to swim right into the chop. That was fun. There were several times when I brought my arm forward to start my pull and there wasn't any water there, which is a pretty strange sensation when you're swimming. I knew there were kayakers everywhere, so I just stayed calm as I made my way across the lake. I really wished I knew how many buoys were out there because Raleigh actually had them numbered to let us know where we were. (Yes, they probably do this every race, but I just haven't noticed.) I looked at the course map, and when the buoys changed color, we were supposed to turn. I was so happy when I hit the orange buoys because I thought it was time to make the turn home. I thought I was FLYING! Unfortunately, the map was incorrect and the start of the orange buoys was only about half way. Sigh. I was still very calm though and never felt out of my comfort zone. When I hit the final turn buoy, I decided to kick it up a bit and see what I had left. Turns out, I had a lot left. Don't get me wrong - I was ready for the swim to be over, but I felt really good. HAZZAH! 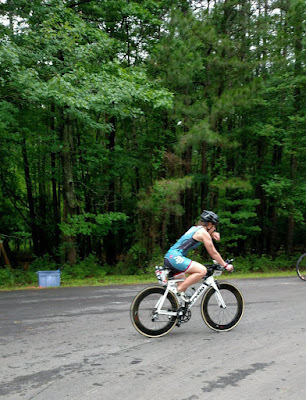 It had been a year since my last triathlon, and I kind of had to remember what I needed to do in transition, which is funny because in T1 all you need to do is throw on your helmet and bike shoes and go. We did have to pack up our swim stuff in our T1 bags though, because nice volunteers were going to collect them all and drive them back to Raleigh for us. Knowing I had three-plus hours in the sun, I stopped at the sunscreen appliers and had them give me a good dose of sunscreen. Bike Out. Setting my Garmin with my teeth. I had been warned the bike course was going to be hilly. Nothing crazy steep, but just unending rollers. I had also been warned by Andrew that based on the power output he wanted me to hit, I was going to be passed - a lot. Not fun for someone who is usually pretty strong on the bike, but again, the point was to train, not to race. Understood. And I was passed. A lot. It was really frustrating, but I have to admit pretty fun once I got out of the "Ahh - I'm being passed by everyone" panic. Raleigh has a really nice bike course and North Carolina is beautiful. I'm sure I noticed a lot of things that a lot of other racers didn't, like Historic Yates Mill. It looked pretty and they have tours. If you're in the area, I suggest you check it out. The good news about trying to stay in my power range was that my legs were pretty fresh for the run. Once I hit T2 (where I had the longest walk to my racking position EVER), I took a few more swigs of my nutrition / hydration and downed a gel. Made another stop at the sunscreen station where they only had lotion, not the spray sunscreen they had at T1. That has to be the worst volunteer position ever. How would you like to apply sunscreen to 2,500 sweaty athletes all day. Ugh. Anyway, I was feeling pretty good when starting the run. I was tired from the day, but I felt like I could easily stay within the conservative paces that Andrew had laid out for me in my race plan. And I did...at first. It was after noon by now, and the temperature was in the mid-to-upper 80's with humidity covering the city like a blanket. But, again, I felt good. I was even kind of chuckling at all of the people who started walking immediately after the bike. I was all cocky thinking "look at you - you cooked yourself on the bike and now you have nothing for the run." Sigh...Foolish girl. I first noticing trouble around mile three in the run. The course was hilly, but it wasn't my legs that were failing. It was my stomach that wasn't feeling great. Nothing horrible at first, but definitely not right. While I was hot, I wasn't dizzy or anything, so I tried to keep going. But then the nausea hit. Apparently, the nutrition I took during the last part of the bike and in T2 didn't absorb and now it wanted to come back up because of the heat / humidity. I'm not going to go into graphic detail, but from mile three-four to the end of the run, I felt like I had to throw up. I would be OK if I walked - the nausea would subside - but when I started running, it'd come back after a few steps. I realized I had a dilemma - I could either continue to run, completely hurl and probably end up in the medical tent, or I could do my little walk / jog thing and live to fight another day. I chose the latter, and even doing that, I still couldn't really keep anything down. I had some water and orange slices - that was it. I tried a GU, but that came back up immediately. It wasn't a whole lot of fun, and I would have been really upset if this had been an A race. Fortunately, it wasn't and I was able to learn a valuable lesson about how my body reacts to humidity and nutrition. I had almost the exact same experience when I raced Augusta a few years back, which was also extremely humid. I obviously need to adjust my nutrition plan in humid weather. I look happy, but I'm not. I saw the photographer and faked a smile. After three hours of wogging, I made the final turn down the long straightaway to the finish. This section was kind of a wind tunnel because of the buildings, and while the wind should have felt good because of the heat, it was a headwind and it felt like something was pushing me backwards. No cool wind. The finish is three blocks away and I'm being pushed backwards after three hours in the heat and humidity? Just seemed like a cruel way to end a race. Stupid weather. When I made the final turn, I decided to try to run it in, rather than walk. I mean, who wants to walk across the finish line, right? With every step, I kept thinking "Don't throw up. Don't throw up. There are photographers everywhere. Don't throw up." And fortunately, I didn't. Ironman knows how to do a finish line. I ran into Catherine at the finish! Yay Nashville! I found out after the race that there was a pretty high DNF rate. I read in a forum that over 100 people were pulled from the swim alone, and judging from the results, it looks like there were a lot of people who dropped from the run or finished over the time cutoff. I also found out after the race that my front tire had gone completely flat at some point in the day. Remember that rubbing noise? I still don't know what it was, but apparently I'm pretty lucky I made back to transition without flatting. Even though it was stupidly hot, I loved this race. I'm sure a lot of that had to do with my mindset of treating this race as a long training day, rather than adding the extra pressure of a race. It was probably the hardest 70.3 that I have done in that both the bike and run courses were hilly, but I knew that going in. The City of Raleigh did a great job with pretty much everything. On paper, it seems like a logistical nightmare, but the race organizers did a great job explaining everything and the two transitions weren't any big deal. There were plenty of volunteers and a lot of people came out on the run to cheer us on. There were a lot of people out on the bike course, too, which surprised me. And as I mentioned in my previous post - my hotel was right at the finish line! That was glorious!! The only thing that could make this race better is if they moved it to May so it's a bit cooler, but that would conflict with Chattanooga so I can't see that happening. I would absolutely do this race again even with the heat, and would recommend it to anyone. 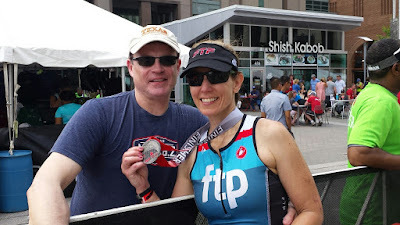 When we last met, I left you with the question of whether three weeks of decent training can get someone through a 70.3. Well - you're just going to have to keep reading to find out. Dudley and I started out pretty early Friday morning for Raleigh. It's funny that the more races you do, the less stressed you get about packing. For my first HIM, I started packing a few days before. For this race though, I started about 8:00pm on Thursday. I have a good checklist so I wasn't too stressed about forgetting anything. We threw everything in the car Friday AM and off we went. One thing I didn't realize before the trip: Raleigh is FAR! For some reason, I thought it was like 6-7 hours away. Sure, I looked up the distance on Google and it had a stated 8+ -hour drive, but Google is always wrong and I figured we could make up some time here and there. Nope. Raleigh is a good 8+ hours away and you also lose an hour because of the time change. So while I was planning on us getting there around 3:00pm, we didn't roll into town until a little after 6:00pm. You win, Google. Fortunately, the expo and packet pickup were open until 7:00pm. Dudley dropped me off at the Convention Center so I could check in before they closed. Other than not having signs directing people to where the Ironman Village was so I had to wander around a bit (it was a BIG convention center and I might have walked into a high school graduation), check-in was great. No line at all AND I ran into fellow Nashvillian and Tennessee Women's Cycling Project club member Catherine while filling out the paperwork. YAY Nashville! I spent the rest of the time at the expo taking random pictures and talking myself out of purchasing a lot of unneeded race swag. I did a pretty good job, too. I only bought my standard items of a name shirt, a water bottle and a race event sticker. Granted, it was still about $50 but the damage could have been much worse. It took me a village to find the Village. Good Lord, I look tired in this photo. The longest car ride in the world will do that to you. I ALMOST bought this towel with everyone's names...but didn't. I met up with Dudley at the tail end of the expo. He had been checking in to our hotel, the Marriott, which was also the host hotel. This was hands-down the most conveniently located race hotel I have ever stayed in. It was across the street from the expo and the finish line for the race literally outside of the hotel doors. Plus, they went all out for the athletes and really made us feel welcome. This was my room key! And yes, I painted my nails to match the race. The hotel was also right in the heart of downtown. When we went out to find a place to eat, we walked into a giant blow-up IMAX theater screen set up for downtown movie night. It was like a festival down there with all sorts of people wandering around, food trucks and other vendors. Fun! Dudley and I had decided on an artisan burger place for dinner which was an easy walk away. (No, I still don't eat red meat, but they had other non-meat options.) Afterwards, I treated myself to some homemade ice cream from one of the street vendors. So good. The next morning I attended the athlete briefing. While these meetings are mandatory, lots of people skip them. The Raleigh 70.3 has different setup than most races with two transition areas and a shuttle and assigned-time bike drop-offs... I figured I needed to go to this one. I'm glad I did too. It was probably the longest athlete briefing I'd been to, but it was very informative and I felt a lot more confident about what I needed to do logistically to be ready for race day. I went back to the room to get ready to drop off my bike at transition. I laid out everything I was going to need for the race to make sure I didn't forget anything, and decided to make a quick stop back at the expo to pick up an extra CO2 cartridge as we were told in the meeting that the heat could affect your tires. Better safe than stranded on the side of the road, right? We then headed over to T1, which was at Lake Jordan. It was about a 30 minute drive. Since we arrived during our assigned time slot, we were able to pull right into T1 and park. Apparently, if you arrived at a different time, you weren't allowed completely into the area and had to walk some. I did a quick spin around the park on The Weapon to make sure everything was running smoothly and then racked her up. Something to note - it was so hot that we were told by race organizers to place a towel under our front wheel to prevent our wheels from contacting the hot pavement. Apparently, the tires will melt. So that was something fun and new to worry about on race day. The Weapon racked and ready to go. I took a quick look out at the swim course. The lake was really choppy, but I was hoping that was just from all of the boats on the lake. Usually when I look out at a swim course, I kind of get a pit in my stomach and think "that looks SO FAR!" For some reason, that didn't happen in Raleigh. I looked at the buoys and thought "that doesn't look so bad. I got that." It doesn't look that choppy, but this dock was really swaying. The orange buoys in the background mark the course. Yellow buoys lining the swim out. Something you pray doesn't need to be used. We headed back to the hotel and met up with one of my best friends from college, Mark, and his wife Laura, for dinner. (FYI - we ate at a restaurant called Bolt. It was fantastic. If you go to downtown Raleigh, you should check it out.) Raleigh was Mark's first HIM and it was fun to experience the race from his perspective. While I was starting to get nervous for Raleigh, it was nothing like how I felt before my first HIM! Of course, since Mark and I went to George Mason, we had to get the obligatory Ironman photo in Mason gear. When Dudley and I got back to the room, I, yet again, went through everything I was going to need for race day. It was then, at 8:30 pm before a 3:30 am wake up call, that I realized I forgot a race belt. I checked my gear at least three times and never realized it until that moment. I ALWAYS forget a race belt! Of course, the expo was long closed, so I texted Mark and Catherine to see if either of them had extra belts. Nope. Improv time. So I started digging through my gear. Surely I had SOMETHING I could use as a race belt. I was almost resigned to the thought of just pinning my bib number to my kit at the start of the run when I saw an old Garmin heart rate monitor and strap. It wasn't perfect, and was a little too big, but it would do in a pinch. Boom. I had my race belt and was ready to go. Today is Global Running Day! If you're a runner, I'm sure you're heard of this, but if you're not - yes, there is a Global Running Day. It's a program started but the New York Road Runners (at least that is who owns the website), and their goal is get as many people running as possible, especially kids. You can find out more about their programs, and pledge your miles here: http://globalrunningday.org. As of right now, they have about 2.5 million people from 176 countries running. Pretty cool, huh? There is also an app you can download that turns your running miles to donations to charities: Charity Miles. You get fit while helping others! It's a win-win! Of course, I highly recommend checking out your local running stores for any sales they might have going on. For those in Nashville, the Nashville Running Company started their Tent Sale today, and Fleet Feet has a Global Running Day instagram contest going where you could win a $100 gift card. While deals are great, the point of the day to do get out and run! Walking is great too! Call a friend and go for a hike! Take your dog with you - he'd love it! Or just go around the block if you don't have a lot of time. Just get out and do something! I'll see you out there!